PACA 1505 State St., Erie, PA, 8:00 p.m. Suggested Donation: $10. Both hinting at Breakstone's attention to the architecture as well as the melodic story in the music he plays. 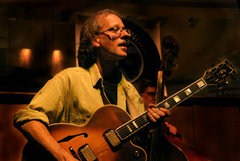 Better known among musicians than by the public, Josh Breakstone was born in 1955 in New Jersey, in a family which encouraged musical interest. He began playing with a high school band in his early teens, was attracted by the music of Lee Morgan and Clifford Brown, then heard Charlie Parker, who lit the fire. Breakstone studied with Sal Salvatore, attended the University of Southern Florida and Berklee, spent some time in Brazil, then back to NYC. Tours of Japan began in 1986, and Breakstone recorded extensively with a Japanese label, then with two U.S. labels. He has produced 19 albums as a leader. Breakstone began teaching at the Rhode Island Conservatory of Music in 1979, followed by stints at Brooklyn College, Queens College and Cincinnati Conservatory of Music. He has been focusing more of his energy in teaching and conducting workshops in recent years, conducting clinics across the U.S. and in Japan, Canada and France. PUT THIS DATE ON YOUR CALANDER. Come hear and learn from this thoughtful, creative musician.